Urgh, writer’s block – I absolutely hate it. But as a blogger, you obviously have to deal with it at times and today happens to be one such day. They say when there’s too much going on inside your life (and mind! ), you really don’t know where to start and that’s exactly what’s happening with me. I have been totally engrossed with family and hospital duties, so it’s becoming increasingly difficult for me to write on the blog. So please bear with me, I am going to keep this really short and quick today. I don’t share a lot of smoothie recipes on the blog but I make them pretty often. 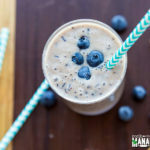 Ever since I realized that I don’t share them as much as I would like, I have made a conscious effort to click picture of some of my favorite smoothies so that I can share them with you. 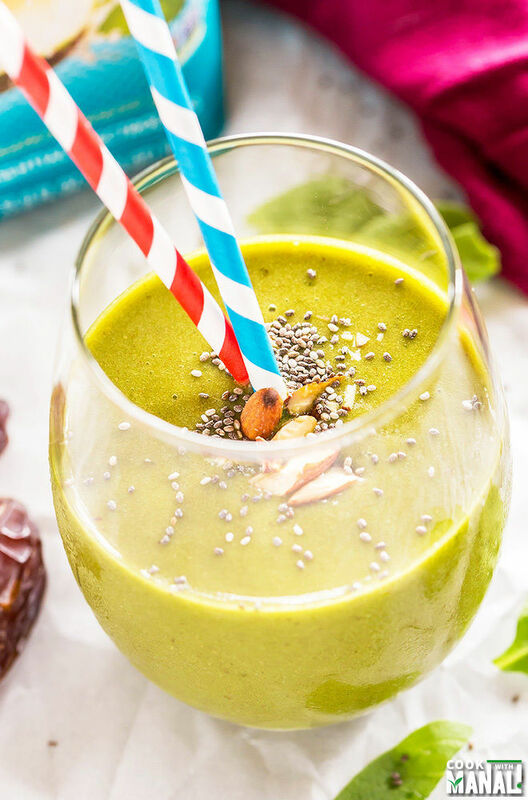 And this Vegan Spinach Smoothie is one of my absolute favorites. If you would have given me this idea of adding spinach to a drink few years back, I would have totally ignored you. Like who adds greens to their smoothies and shakes?! But that was then, when I didn’t have a food blog and obviously had no sense of what can work. 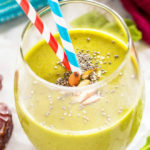 Green smoothies have been quite a rage for few years now but somehow I was always skeptical to try them but now I wish I would have tried them earlier! They are so good! For those of you who are not sure how spinach tastes in a smoothie, trust me it tastes great! For this vegan spinach smoothie, I used a mix of frozen fruits – mango, pineapple, peaches and strawberries. It’s always a good idea to use frozen fruits in smoothies since they make the smoothie thick & creamy. 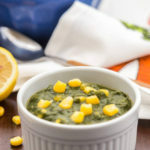 You can use any combination of fruit here but this pack I got from Costco and I thought the flavors went so well with the spinach. The base of my vegan spinach smoothie is coconut water. You can use plain water or any fruit juice too but I love using coconut water here. If you don’t have coconut water, my suggestion would be to use orange juice, I am sure it would taste great! The smoothie is lightly sweetened with dates, but you use any other sweetener of your choice. 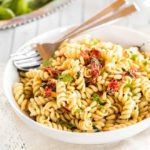 I hope you guys give this recipe a try. 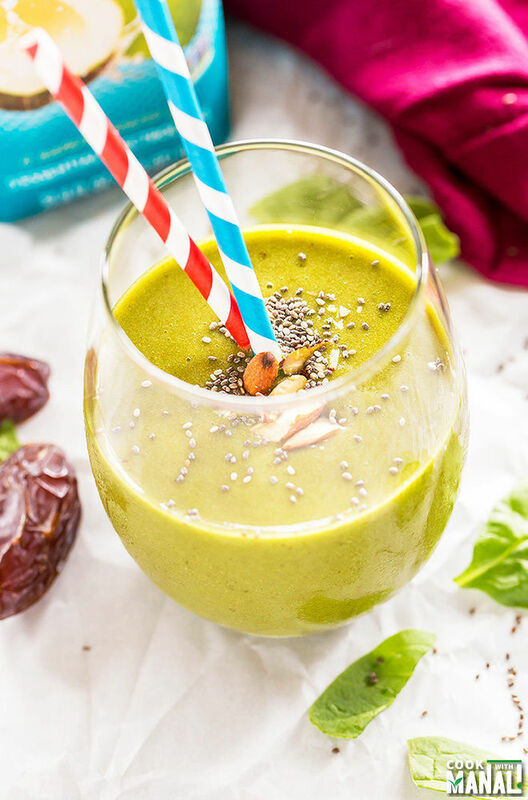 This vegan spinach smoothie is not only healthy but also delicious! And the best part is that it comes together so quickly especially when you have no time to prepare an elaborate breakfast in the morning. Simply mix everything together > blend > pour into glasses and enjoy! * You can use fresh fruits here. It’s not necessary to use frozen fruits but I definitely recommend it. It makes the smoothie thick and I really like that consistency in my smoothies. * I sprinkled some chia seeds and sliced almonds on top of the smoothie just to make it more nutritious but that’s totally optional. 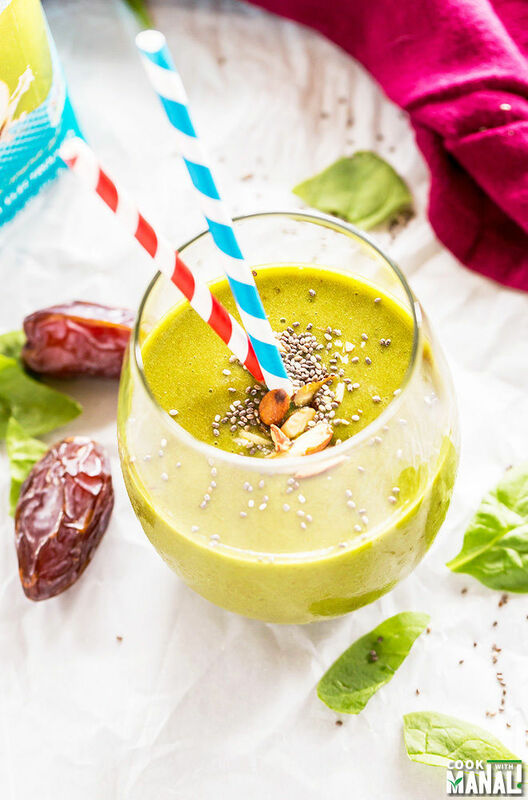 Vegan Spinach Smoothie is easy, delicious & the perfect way to start your day! To a blender add spinach, frozen fruits, coconut water and chopped dates. Blend everything till well combined. 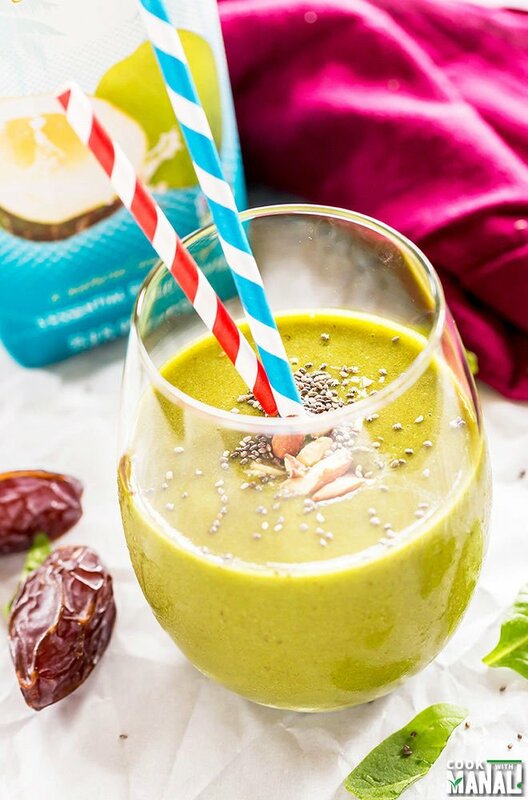 Pour smoothie into glasses, sprinkle some chia seeds and almonds on top (optional) and enjoy. Oh, I totally feel ya on the writer’s block thing, Manali! I actually keep a little notepad of post ideas whenever something interesting pops up. And I still get writer’s block. Maybe we just need to hire a writer so we can stay in the kitchen all day? 🙂 Either way, these smoothies look amazing. I’ve never jumped into the green smoothie thing, so I think it’s time to do that! That’s a good idea, I should probably also keep a notepad handy! Thanks David and you need to try green smoothie! This smoothie sounds like the perfect way to start the day, Manali! You’ve been on my mind a lot lately! I just want to say how much I admire your strength! Your family is very lucky to have you!! Thank you Jen! love you! I start every day with a spinach smoothie, and I have done for a couple of years, and I feel so much better for it! Love green smoothies! This looks delicious! Hope things go well! I’m thinking of you guys! Mmm what a great way to start out the day. I love green smoothies but haven’t made one in forever! I love smoothies, in fact they are my breakfast on most of the days! This one looks so pretty and delicious, Manali. Great post! Writer’s block can be the pits sometimes. With video on the rise, blog writing will soon be a thing of the past. 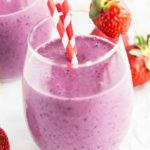 BTW- This smoothie looks delicious! Writer’s block is a real drag, my friend. I know we’ve all been there. I also know that your family is really lucky to have you and appreciates your love and commitment to your mom. I hope you are getting the support you need and I’m thinking about you and your family. Hugs, friend. Manali, if all you do is share your recipes and pictures, I know that I, for one (and I’m sure all would agree), would be very satisfied!! Writer’s block is no fun…but your reasons for it are understandable. Hugs, my friend. Love this green smoothie. It’s the way to start the day! Dates in a smoothie are a guaranteed success! I totally feel you on writer’s block – hits me almost every month by fail haha. Anyway, this smoothie seems like the total cure 😉 love how gorgeous it looks! I was looking for good smoothie proportions after some disgusting attempts at just throwing greens and fruit in the blender. This one was delicious, even my 5 year old loved it!. I didn’t have dates so I gave my smoothie a glug of maple syrup. I added a bit more water since I like my smoothie a thinner. Thanks so much!